Airbus Americas has joined the Institute for Advanced Composites Manufacturing Innovation. 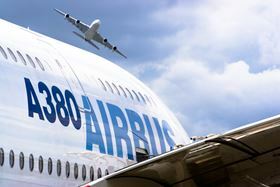 Airbus Americas has joined the Institute for Advanced Composites Manufacturing Innovation (IACMI) as a premium industrial member. ‘We are enthusiastic and energized by the possibilities to work within the IACMI network of member organizations to develop technologies that will reduce the cost and energy consumption of composite manufacturing,’ said David Hills, vice president, research and technology, Airbus Americas. This would include developing technologies to improve the recyclability of carbon fiber composites, Airbus said. ‘The move also helps Airbus Group in its effort to build upon existing technology partnerships with U.S. universities, laboratories and suppliers while exploring new technology collaborations with the other IACMI members,’ the company added in a press release. This story uses material from Airbus Americas, with editorial changes made by Materials Today. The views expressed in this article do not necessarily represent those of Elsevier. EOS North America has joined US additive manufacturing institute America Makes as a platinum member.